There are several options for joining us at the retreat: you can join us for the day or stay the night by registering for a motel room, bunkhouse, tent camping, or treehouse. Kids 4 and under are completely free. 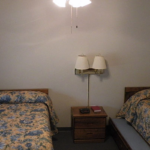 There are 24 motel rooms at Bergland Center, where you will check in. 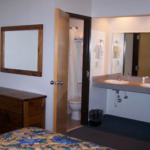 The rooms have a queen bed and a twin bed with trundle bed, private bath, and air conditioning. Linens (Sheets, pillows, and towels) are provided. You are welcome to bring sleeping bags, cots, or other sleeping accommodations for the floor. Rooms are priced per night regardless of the number of occupants. If you are sharing a room with your family or non-family members please register together, including all members of your group. $120/ per night. Register early as rooms fill up fast. $15 / per person if staying overnight. $20 / per person if coming for the day on Saturday. Want to attend but may not be able to pay full price? WE WANT YOU!!! Please ask about the availability of limited scholarships by August 16.